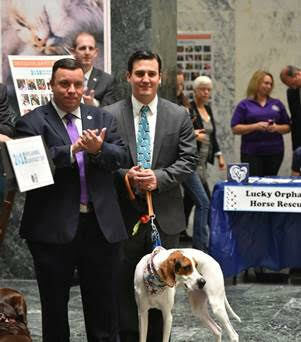 As is an annual tradition in Albany, Assemblyman Karl Brabenec (R,TCN-Deerpark) joined colleagues and many of their pets for Animal Advocacy Day in Albany today. Brabenec sponsors bipartisan legislation, Kirby and Quigley’s Law, which would toughen penalties against those who harm animalsduring the course of committing certain crimes. The bill is named after two dogs that lost their lives during a home invasion and robbery.